So, here we are. It's January. January 7, to be exact. 2010. And yet, still no Chaos Christmas post. What is this world coming to?! Of course, I guess my last post kind of explains what I've been doing. That and the painting. But I have to post our Christmas festivities. Just like I have to post my New Years Resolutions. Mostly because hardly anyone does that and I like to be original. Sadly, my pictures are still showing up weird and not nearly as cute as in person. I haven't figured out why yet, but hey...that's why I married a computer geek. Love you CG. The Reindeer Food....That We Forgot to Sprinkle on the Lawn. Oops. So nice that you have captured memories for your babies. They will come to treasure your words and pictures! The photo of Babs with Santa is priceless. :D All your goodies look so tasty. It looks like a fun, exhausting time, and isn't that how holidays should be? Thanks for bringing me some goodies. Sob. 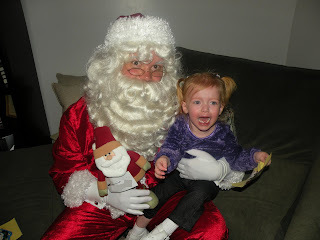 Santa pictures with kids screaming are my favorite! Those goodies look fabulous! (as do the pics - even with a weird display) Are you sure you're not one of those "pod people"? I mean, you seem to do everything so well... it's almost not human!! mmmmmm...what WERE those treats?! Explain! Must know!! Tip Tuesday-Teasing & Taunting & Screams, Oh My!